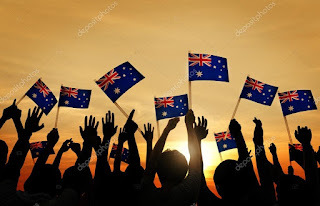 Australia celebrates 26th January as Australia Day which marks the landing of the First Fleet, a convoy of 11 ships carrying convicts, at Port Jackson in 1788. It also marks the founding of the colony- New South Wales. Initially, the celebrations were confined to New South Wales. The first founding day was celebrated on 1838, 50 years after the First Fleet arrived in New South Wales. By 1926, almost all states of Australia were celebrating the Australia Day and it was being referred to as Anniversary Day in New South Wales. It is said that there are two Australia's, one is the land occupied for more than 50,000 years by Indigenous people before the arrival of the First Fleet, and second is the Australia that was colonised in 1788. The colonisation of Australia led to disastrous consequences for the indigenous population. On 26th January 1938, the Aboriginal people gathered in Sydney to mark a 'Day of Mourning' to protest against the callous treatment done to them by the white men during the past 150 years. In 2008 then-prime minister Kevin Rudd formally apologised to Australia's Indigenous communities over historic government policies of forced child removal and Indigenous assimilation. There are now demands to change the date since the Australia Day should bring the country together not divide Australia. Q. When is Australia Day celebrated in Australia to mark the landing of the First Fleet, a convoy of 11 ships carrying convicts, at Port Jackson in 1788?